YES Network announcer Ian Eagle is excited about the new era of the Brooklyn Nets, led by General Manager Sean Marks. Eagle is encouraged by how Marks is building this team, the hiring of Head Coach Kenny Atkinson, and the signing of point guard Jeremy Lin. Orlando City SC Head Coach Jason Kreis. USA Today Sports. Jason Kreis thought he got a raw deal when he was fired after just one season as coach of New York City Football Club. 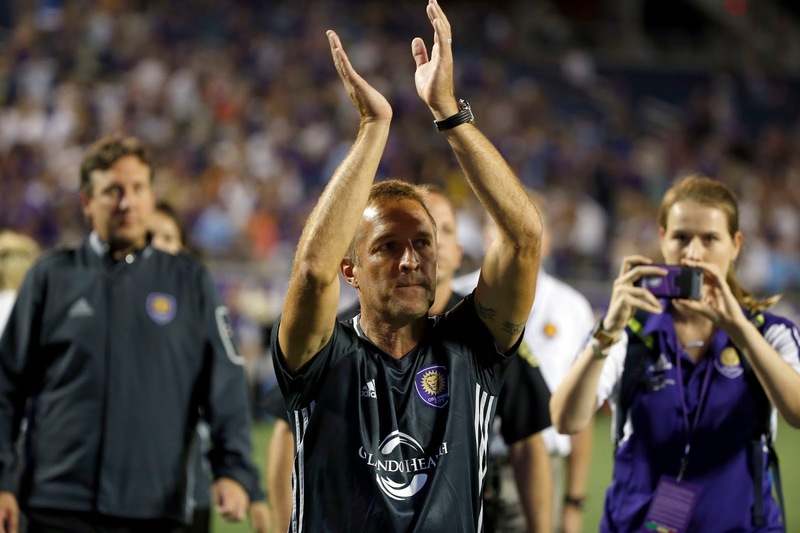 Kreis got his revenge on Sunday night, as his new club, Orlando City SC beat NYCFC, 2-1. Orlando City got two goals from their star Kaka, while NYCFC's European stars, David Villa, Frank Lampard, and Andrea Pirlo, were largely kept in check. 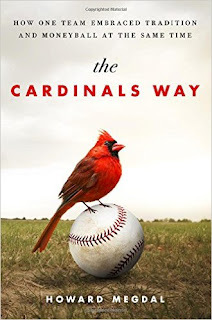 The St. Louis Cardinals are one of the great franchises in baseball history and they are in the midst of one of the most successful periods in their history. They have made the playoffs in each of the past five seasons. In that time, they won the World Series in 2011, made it back to the Fall Classic in 2013, and reached the National League Championship Series twice, losing to San Francisco both times, in 2012 and 2014. Howard Megdal takes an extensive look into their history, dating back to the days of Branch Rickey a century ago, in The Cardinals Way. 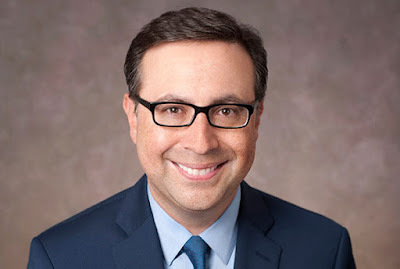 "Coming on the heels of Tony LaRussa's 2011 World Series championship in his final season, the Cardinals have put together the kind of sustained success that is rare in baseball, drawing all kinds of attention and a simple question. How are they doing it? The St. John’s Red Storm announced their men's basketball out-of-conference schedule on Thursday. NYCFC's David Villa battles LA's Nigel De Jong. USA Today Sports. This was the first time the number 8's, English national teammates Lampard and Gerrard, faced each other in the MLS. For years, they battled in the English Premier League when Lampard's Chelsea and Gerrard's Liverpool vied for titles. 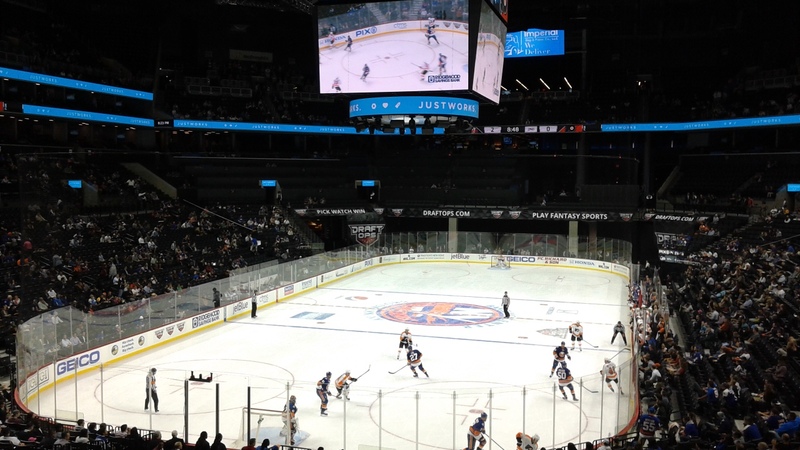 The Islanders in action at Barclays Center. Photo by Jason Schott. Schedule highlights include Islanders vs. Rangers games in Brooklyn on Dec. 6 and Feb. 16. The team will welcome the defending Stanley Cup Champion Pittsburgh Penguins to Barclays Center on Nov. 18 and Nov. 30. Other featured home games against division rivals include three matchups against the Capitals (Dec. 13, Dec. 27, Jan. 31) and a pair of matchups against the Devils (Feb. 19, March 31) and Flyers (Nov. 3 and Jan. 22). The Nets will make their first visit across town to play the Knicks on November 9 at The Garden. This will be Jeremy Lin's first visit as a member of the Nets to face his old team, where he became famous amidst the Linsanity phenomenon. The new-look Knicks come to Brooklyn on February 1. A month later, they play twice in five days, March 12 at Barclays and March 16 at The Garden. 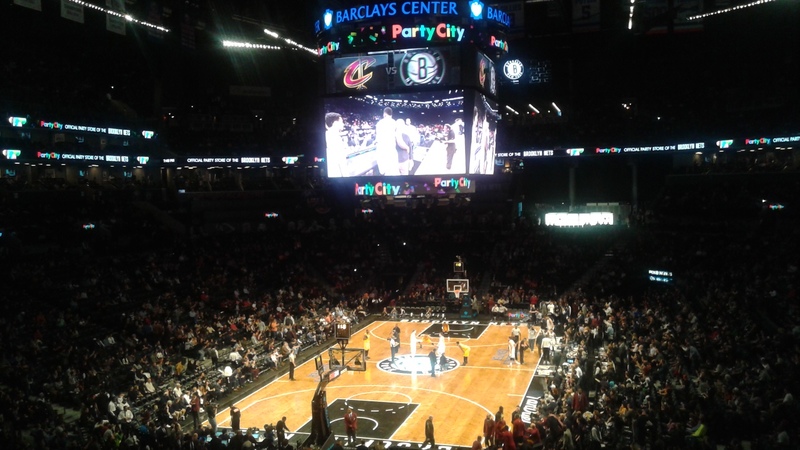 The World Champion Cleveland Cavaliers come to Brooklyn on Friday, January 6. The Nets travel to Cleveland on December 23 and January 27. 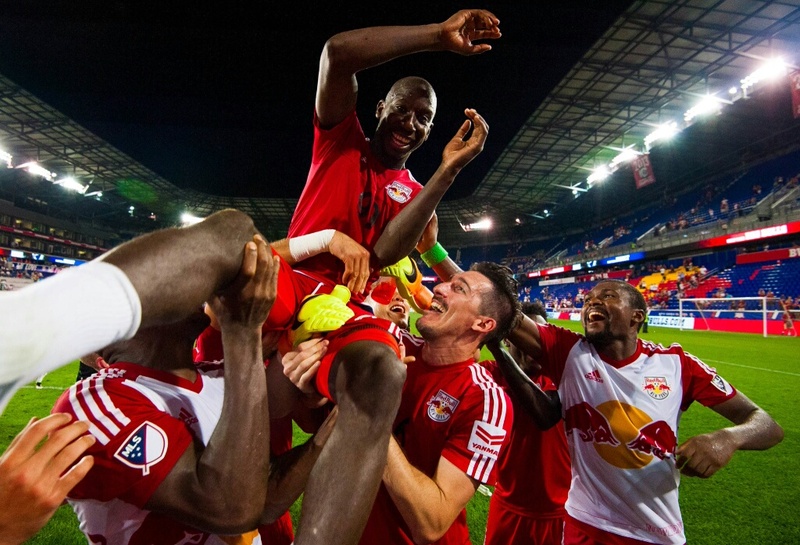 With a brace in Saturday's 3-1 win over the Montreal Impact, Wright-Phillips became the Red Bulls' all-time regular season leading goal scorer with 59 goals, surpassing club legend Juan Pablo Angel's record of 58. Andrea Pirlo with a young fan. Photo courtesy of NYCFC. 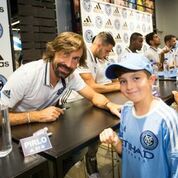 On Tuesday, August 16, fans had the chance to meet the full New York City Football Club team at Adidas’ Downtown Brooklyn Store. 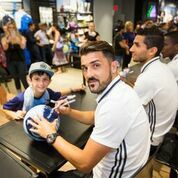 David Villa signing a soccer ball. Photo courtesy of NYCFC. St. John's continues their historic rivalry with Syracuse this season, as they will meet on December 21 at the Carrier Dome. This will be the 91st meeting in a storied rivalry that dates back more than 100-years. When Syracuse left the Big East in 2013, there was concern as to what would happen with this historic rivalry. It wasn't long before the schools entered into a home-and-home series, where they would meet once each season. 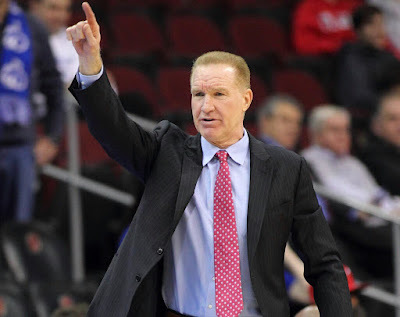 St. John’s has captured victories over Syracuse in their previous two meetings, including last year’s 84-72 triumph against the Final Four-bound Orange on Dec. 13 at Madison Square Garden. 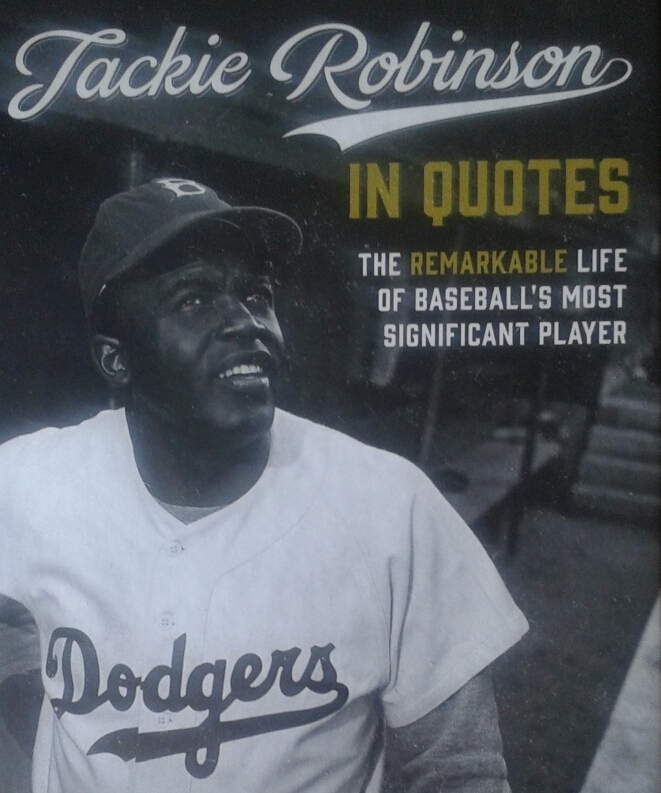 Danny Peary's new book, Jackie Robinson In Quotes: The Remarkable Life of Baseball's Most Significant Player (Page Street Publishing), is perhaps the most engrossing piece of work on the pioneering Brooklyn Dodger. This commemorated when Robinson made his debut with the Montreal Royals, the Dodgers' International League team. "I played hard, and always to win," which Robinson said in Baseball Has Done It in 1964, is just one of his many quotes. Perry says of Robinson's activism, "Jackie Robinson was telling people, 'Black Lives Matter,' more than half a century ago. There has never been a book like this honoring one of America's most heroic icons. Everyone has opinions about him; Robinson was a revered and sometimes polarizing figure who had an unparalleled impact on America's social history before, during, and after his baseball playing career. "As his own quotes make clear, Robinson never stopped speaking, never stopped agitating, never stopped striving for equality and social justice for all Americans. As a result, no player since World War II was more discussed, praised and attacked both verbally and in print," said Peary. There are illuminating quotes from Jackie's wife, Rachel Robinson, and the rest of his family; Hank Aaron, Kareem Abdul-Jabbar, Muhammad Ali, Yogi Berra, Ralph Branca, Roy Campanella, Carl Erskine, Bob Gibson, Hank Greenberg, Derek Jeter, Dr. Martin Luther King, Jr., Sandy Koufax, Mickey Mantle, Willie Mays, Don Newcombe, Walter O'Malley, Pee Wee Reese, Branch Rickey, Paul Robeson, Vin Scully, Duke Snider, Ted Williams, Don Zimmer. David Villa scored twice in the final 10 minutes, but it was not enough to get New York City Football Club a win against the Columbus Crew SC, and they settled for a wild 3-3 draw at MAPFRE Stadium Saturday night. Frank Lampard got the scoring started in the 41st minute with his ninth goal in the last 10 games. Columbus goalkeeper Steve Clark parried Andrea Pirlo’s 26-yard free kick off the post and Lampard pounced, tapping in from the edge of the six-yard box to give NYCFC the lead at the break. 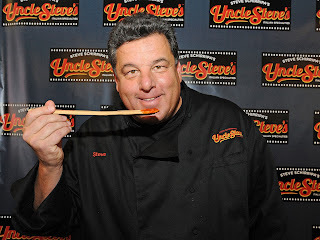 I caught up with Schirippa recently, and touched on that, plus his tomato sauce, Uncle Steve's. "I got a call, they sent me a script. I thought the writing was great. I never really watched the show, to be honest, I was aware of it, but never really watched it. They offered me this role, I was happy to do it, they offered me another one, another one, another one, and I'm coming back this year. We return to work next week and I should do double the amount of episodes, last season I did eight, I plan on doing 16 of the 22. It's a great show., very popular, great acting, the writing is fantastic, and that's why it's been winning Friday nights six consecutive years. 13 million people are watching." The closest character you work with is Bridget Moynahan's Erin Reagan. What's she like? "she's great. From day one, we got along great, from the first scene we did together, I think she's great. A really, really good actress, and I've worked with a bunch of them, and she's as good as any of them. I really enjoy going to work, and working with her, we're shooting on the streets of New York, in Brooklyn, and it's been fantastic.I look forward to this season. I worked with Donnie Wahlberg once, I've met the other ones. I haven't even met everybody yet because don't forget, there's different storylines. Everybody thinks, you're on a show, you're all best of friends, like Tom Selleck, I met twice. He was great, but I haven't worked with him. Wahberg was great, I love what he does on the show. Some of the guys, the crew, are from The Sopranos, so I knew some of them. The directors have been great. I couldn't be happier, happy to be a part of it. You and Donnie get into it about sports, since he's a Boston guy and you're New York? We talked a bit early in the year about the Knicks and Celtics. He's a die hard Celtic guy and that's good. The Knicks, I'm hoping, I'm cautiously optimistic. I certainly am, we're going to be better. It could be great if everyone stays healthy, and (Jeff) Hornacek. It's really a new beginning, it could be great. I just hope these guys stay healthy, you know. They're trying to expand their fan base, I'll be politically correct. 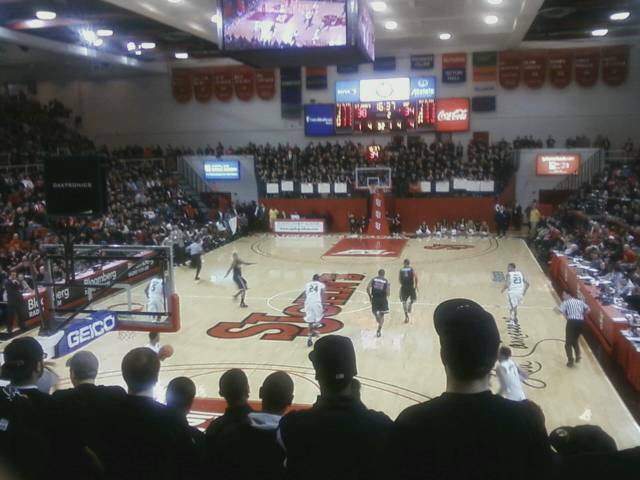 I'm not a Jeremy Lin fan. I think he's cocky and I don't like what he had become. I loved Linsanity, I was there for it. I was there the night with the Lakers. Incredible, incredible guy, which the Knicks needed at that time, but I don't like what he's become since then, and let's see what he's going to do with the Nets. It's great for them, but I think they're trying to expand their fan base. I think it's more than his play that they hired him for, let's put it that way. They're also paying him an awful lot of money, man. I mean, I think $12 million a year, he's really a backup guard. You can't take away and deny Linsanity. It was a great moment in New York Knick history. The Sean Marks and Kenny Atkinson era for the Brooklyn Nets is officially under way, as they showcased the newest members of the team on Wednesday, July 20 at the HSS Training Center. 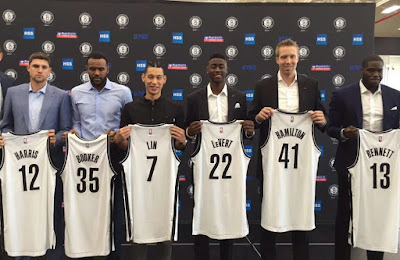 The Nets introduced Jeremy Lin, Caris LeVert, Anthony Bennett, Trevor Booker, Joe Harris, and Justin Hamilton. 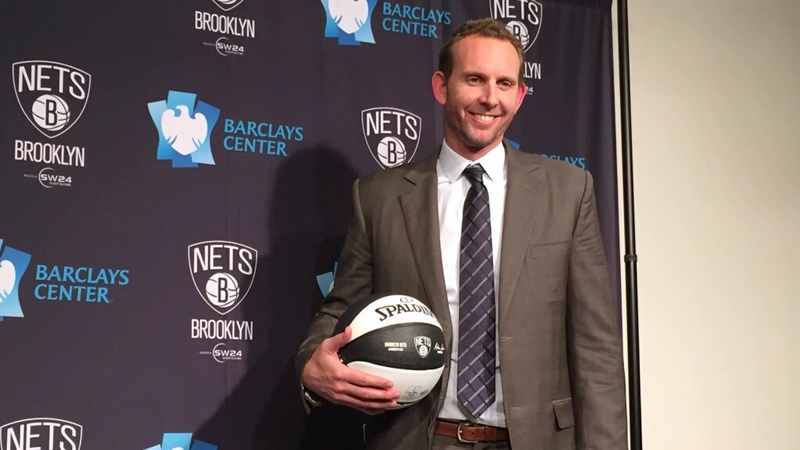 "I would like to welcome you guys and your families to the Nets' family, Marks, the Nets General Manager, said. "The process that went through here as Kenny (Atkinson) and I embarked on this journey a couple of months ago, you've heard us say it's about high character, high quality guys who are competitive, and that's what you see in front of you. That's what we went out and tried to find and we did that. 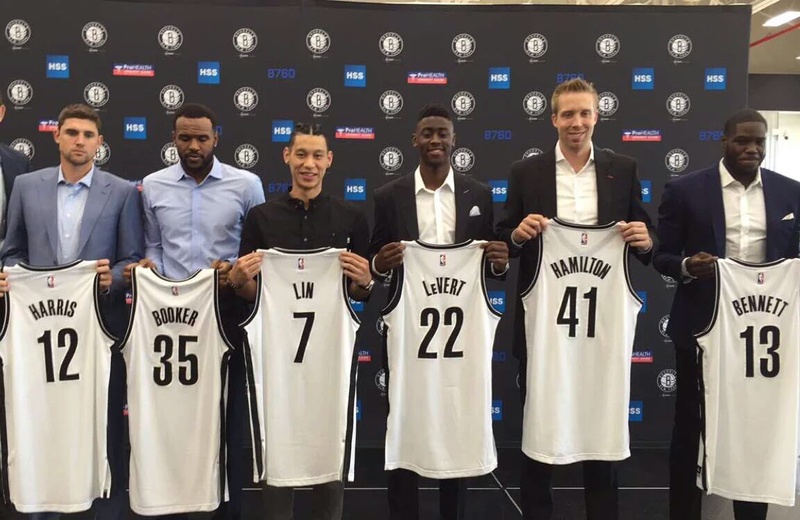 We're excited to have this new group, this new era of Nets basketball. "Obviously, Kenny and his staff played a huge part in this. With young players, its more than what happens on the court, it's what happens off the court as well, behind the scenes. It's all the little things, the nuances that perhaps the rest of us don't see all the time, and that's where Kenny, and his staff, is so good.